Popularly known as "Redbud City" because of the gorgeous redbud trees that line city streets and major roadways, Buchanan was originally known as McCoy Creek, named in 1833 after early settler Russell McCoy. 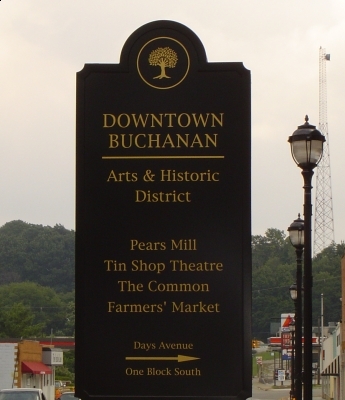 Eventually the town would become known as Buchanan, after James Buchanan, Pennsylvania Senator and the 15th President of the United States. Buchanan had taken the Territory of Michigan's side during its battle for statehood. 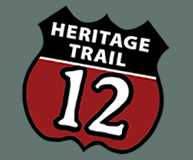 Much of the city's rich history has been preserved along Front Street, which includes many beautifully restored 19th-century homes. The town's fortuitous location is at a juncture where the St. Joseph River drops 60 feet to create powerful water surges. These rapids once propelled 13 mills that at one time lined the mill race and McCoy's Creek, including Pears Flour Mill, the sole surviving mill. Built in 1857, this Greek Revival working mill has been fully restored with a water wheel and millstones that continue to grind flour and cornmeal. Buchanan has excellent facilities for boating and fishing. Public access and launch sites on the St. Joseph River are located below the dam and on North Redbud Trail above the dam at Redbud Riverfront Park. Myriad lakes in the area provide additional boating, fishing and swimming sites. Camping facilities include Fuller's Resort and Campground on Clear Lake, and Bear Cave Resort, boasting the only natural cave in Michigan. During the Civil War, Bear Cave was a stopping point on the Underground Railroad. Fernwood Botanical Garden and Nature Preserve - beautiful gardens surrounded by forest are tucked into a landscape of 105 acres of cultivated and natural areas along the scenic St. Joseph River valley. The Tin Shop Theatre - now in its 25th year of production, the theatre is located in an historic building constructed in 1865 as a furniture shop. Run by the Buchanan Area Fine Arts Council, the theatre offers an ambitious summer play schedule and conducts children's workshops. The Buchanan Art Center - located in a midcentury Prairie-style building, the center houses three galleries displaying local artwork. Wheatberry Restaurant & Tavern - features top-quality barbeque smoked on site. Tabor Hill Restaurant & Winery- provides tasting tours and a superb dining experience in a casual country setting. Union Coffee House - enjoy your daily cup of joe in a lovely restored bank building with original mosaic tile, marble walls and soaring glass windows.